The holiday season is a marketing gold mine for many brands and this past year was no exception, with a number of pop-up shops emerging just in time to entice even the busiest New Yorker to stop—and shop. From fashion to tech brands, here are five of the Big Apple’s best holiday pop-ups. Overtaking a 16,000-square-foot space in New York City, the Target Wonderland pop-up served as both a retail location and a concept store that could become the new norm at future Target locations. The experience began as consumers picked up their RFID keys, which allowed them to select merchandise without having to push a shopping cart around. From there, the Willy Wonka-esque retail playground offered 10 tech-driven “spectacles” for consumers to interact with. 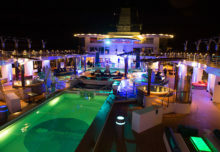 Engagements included Skyping with Santa, participating in a hands-on drone testing activity, posing for pictures at the photo booth or selfie wall and creating customized Christmas ornaments with ultra-fast etching technology. Consumers could even have a giant Etch A Sketch take their picture then turn the image into a doodle of their likeness on the screen. Our favorite part: Shoppers were given a number at checkout and told to wait at the fireplace. When the number appeared, their selected purchases dropped down the chimney. Agency: 72andSunny, Los Angeles. With pop-up stores at iconic locations like Boston’s Copley Square and Manhattan’s 5th Avenue, the Land’s End shop was bound to make waves. The clothing and home goods brand stocked its ski chalet-themed pop-ups with select merchandise, including a curated collection of the brand’s favorite holiday gifts. For those looking to get into the holiday spirit, the shop offered a hot chocolate bar and a cozy lounge with a fireplace. Other highlights included a selfie station located outside dressing rooms and on-site monogramming for a variety of items. The newest Land’s End holiday campaign, including imagery and video, was also featured at both locations. No stranger to holiday pop-ups, tech publication Wired adopted a completely new strategy in 2015. Creating what it called a “phygital” (half physical, half digital) store, the brand leveraged a high-tech window-shopping experience, available to the public 24/7, called Always On. Choosing from a selection of hand-picked products curated by Wired’s editors, consumers were not only able to view the physical items, but could highlight them on an interactive touchscreen to receive an enlarged image of the product that offered further details. Visitors could also use the touchscreen to add any of the displayed items, including Beats by Dre speakers and smart watches, to a Wired wishlist. The list was later texted to the consumer with links showing where to buy the selected products. Gwyneth Paltrow’s upscale lifestyle brand, Goop, arrived in Manhattan’s Columbus Circle as Goop Mrkt, a month-long pop-up shop that catered to the well-to-do. Designed by interior design firm Roman and Williams, the store was arranged to feel like an upscale New York apartment. The space was complete with a kitchen, powder room and living room/salon, all equipped with corresponding home goods and beauty products. In addition to racks filled with high-end clothing brands, the store featured items chosen from a collaborative effort between Paltrow and Valentino. 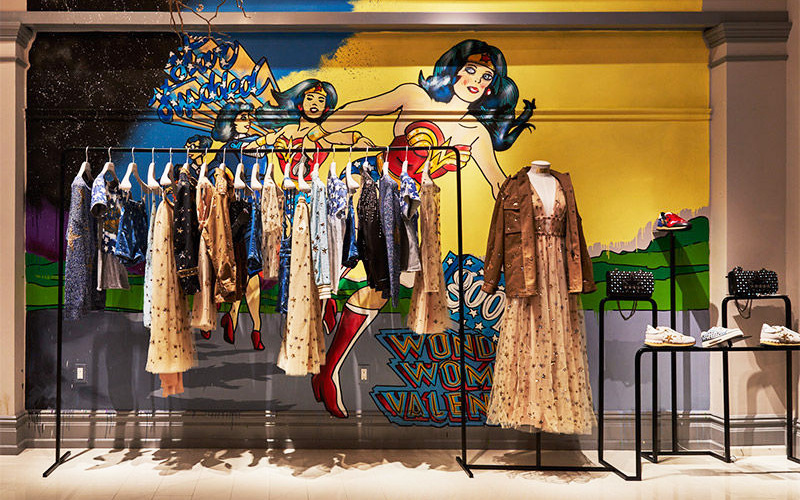 The collection was dubbed Wonder Woman Valentino and aptly placed in front of a large Wonder Woman mural. Goop Mrkt also offered matcha green tea lattes by the West Village-based Chalait and daily makeup touch-ups. In-store events like book signings and holiday wreath demos were also part of the experience. The bad news? Thieves stole more than $170,000 in jewelry from the store just two weeks after it opened. Pier 1 turned its 2015 holiday catalog into a limited edition pop-up book, but it was the life-sized Manhattan installation of the catalog, Pier 1 Imports: Christmas Pop-Up Storybook, that really generated buzz. In an effort to showcase its merchandise in a unique and immersive way, the retailer invited consumers to literally walk through storybook scenes to uncover Pier 1’s holiday offerings. Teaming up with singer Mariah Carey, the brand created a modern holiday story based on her iconic song and new children’s book All I Want For Christmas is You. Along the way, visitors discovered themed scenes, including Plaid Tidings, Frosted Noel, Home Sweet Holiday and Champagne Shimmer. The experience also included the hashtag #Pier1PopUp to accompany the shop’s myriad photo opportunities.